For walking, for crawling - a perfect developmental toy! Colourful, sturdy and beautifully crafted, the Push N Roll Along toys are designed to be the perfect play toy for small children supporting and encouraging them as they develop from sitting to crawling to walking. 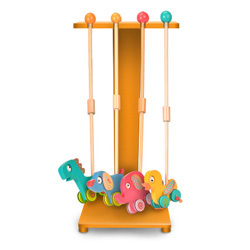 It comes with a detachable wooden rod that inserts easily into the back of the toy. The Push N Roll toy can be rolled (sitting or crawling) or pushed (walking) via the wooden rod with an easy-to-grip ball shaped handle.